Donita Stanley had tears streaming down her cheeks in the pregame. She was a proud Hawkeye supporter. 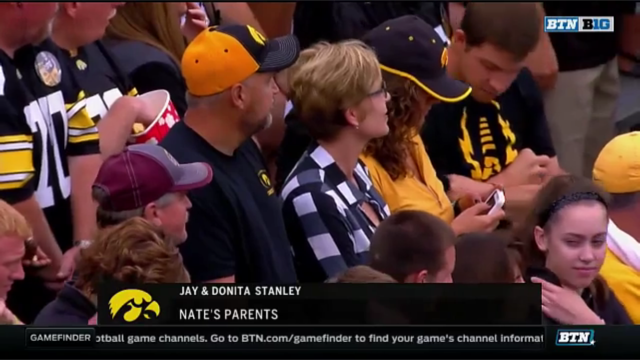 Her son, Nate Stanley, was making his first career start on Saturday for Iowa at quarterback. Both of Nate’s parents were in the stands, along with his high school coach, Joe La Buda. Donita Stanley grew up just an hour and forty-five minutes away from campus in Wellsburg . The outpouring from her Iowa-native friends and family this week was impressive. As she wiped away the tears on her cheeks, she explained her added emotion. Nate’s grandmother wasn’t here today, she had passed when he was a senior in high school. Nate’s father, Jay, bowed his head while his wife reflected. He has been the offensive line coach at Nate’s high school (Menomonie) in Wisconsin. “What advice did you give your son for today?” I asked. 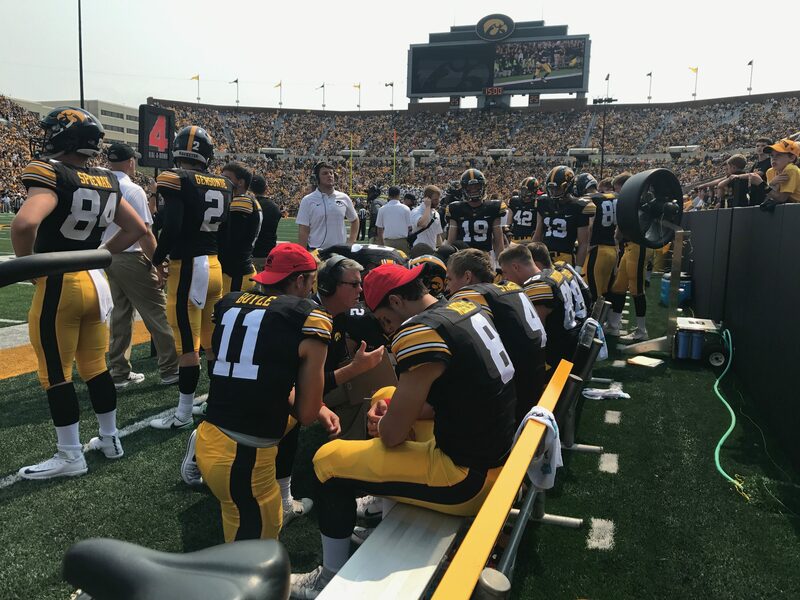 Iowa’s quarterbacks coach Ken O’Keefe wouldn’t approach Nate Stanley on the sidelines without his clipboard. The veteran assistant had a graduate assistant log every down on a sheet of paper. After a series was complete, O’Keefe would grab the clipboard, walk up to Stanley on the sideline, and point to every play from that previous serious. The immediate, direct and play-by-play feedback the sophomore was getting was impressive. O’Keefe’s calm approach was exactly what Stanley needed from the sideline. The offensive line coach turned offensive coordinator this year had to quickly change his approach, on how he deals with his players and how he views a football game. “I’ve already called this game in my head a lot,” he admitted after taking a summer of watching TV copies of games and calling his own plays in his head. Iowa’s defense was a big story on Saturday, making life miserable for a possible high draft NFL draft pick in Wyoming’s Josh Allen. This summer, the Hawkeye D has bonded in a unique way. Six defensive linemen and two defensive backs pooled their money together and bought an RV camper for $500. They saw it advertised on Marketplace on Facebook. And if it looks old, it is. Rats, no. But some leaking issues, yes. “We ripped out the insides,” said defensive end Parker Hesse. The Rat Trap, now completed with futons and other sitting/sleeping accommodations, made for a perfect vehicle to road trip to 4-5 different summer outings. 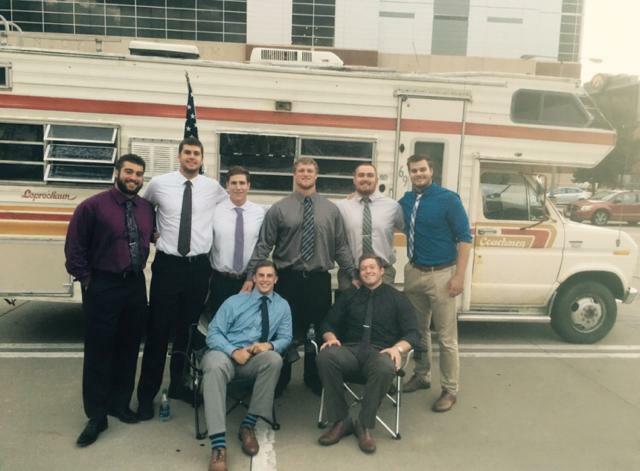 One of those was to the wedding of former Iowa defensive lineman Drew Ott.